One of Santa Fe’s super-fancy downtown hotels, the Inn and Spa at Loretto, is offering rooms for just $129 if you book by March 4 and stay by April 30. The rooms look very, very nice, and the spa features aromatherapy, hot stone massages, and all-natural, organic, fair-trade skin products. The Inn also has an in-house restaurant, a heated outdoor pool, a 24-hour fitness center, three art galleries, and a few other specialty shops. This place is gigantic! As a Santa Fe native, I’ve obviously never stayed here. But I can tell you that the Loretto’s location is pretty much perfect. You can walk to the Plaza, meaning that some of Santa Fe’s best restaurants, bars, bookstores, art galleries and museums are about two minutes away. I would still recommend renting a car so that you can drive into the mountains and take in some spectacular views. 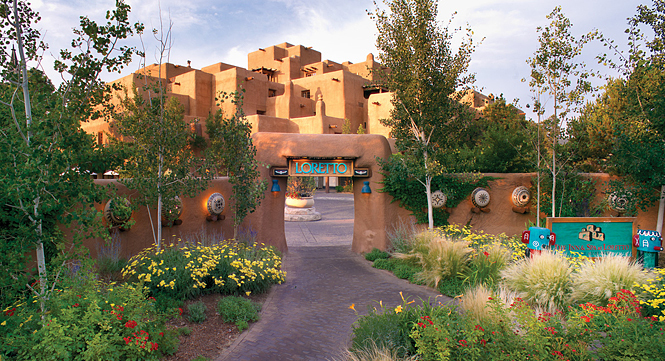 But if you’d really rather go carless, this location would ensure that most of Santa Fe is still at your fingertips. The Loretto is also right next to the famous Loretto Chapel, a gorgeous Gothic-style church that houses one of Santa Fe’s most enduring mysteries. The story goes that the nuns of the church needed to build a staircase up to the choir loft, but couldn’t afford to do so. They said novenas asking Saint Joseph (patron saint of carpenters) for help for nine days. On the ninth day, a mysterious man arrived with an armful of tools and set to work building the staircase. Months later, when the construction was finished, he disappeared without asking for payment or ever giving his name. The finished staircase is a spiral structure, but lacks a central supporting beam. It doesn’t look like it’s physically possible for it to stand up on its own, but it does. Many Catholics consider the staircase to be miraculous, and insist that it was built by Saint Joseph himself. The mystery of who built the staircase, and how it manages to stay up, endures to this day. So stay at the Loretto – you can walk over to the chapel and decide for yourself!